Health Care Justice - NC members attended the Poor People's Campaign: A National Call for Moral Revival rally in Raleigh on June 4 to support health care for all and the health of our planet. About a dozen persons from Charlotte participated, including the "white coat brigade" of medical providers and citizens from all over the state. HCJ-NC members spoke at the rally for expanding Medicaid in N.C. now and implementing universal single payer health care for all Americans. 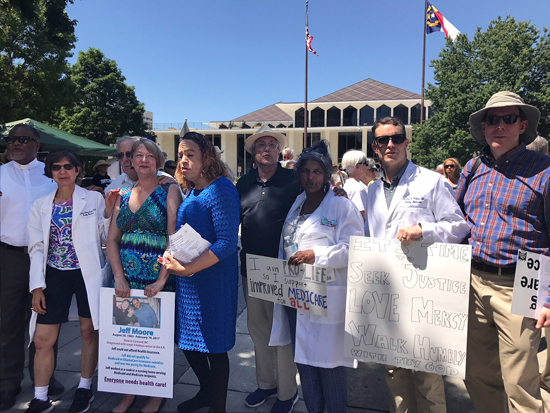 Health Care Justice - NC members Dr. Jessica Schorr-Saxe, Allen Saxe, and Margie Storch were among 13 people arrested in the N.C. General Assembly Building for instructing N.C. legislators too loudly on the need for a healthy environment and health care for all.